Ranu is a Village in Padra Taluka in Vadodara District of Gujarat State, India. It is located 21 KM towards west from District head quarters Vadodara.In this village a popular Hindu Temple of Goddess Tulja Bhavani.It is located in Ranu village which is situated Padra Taluka Vadodra district.The temple is very beautiful.Here is some Fact about Goddess Tulja Bhavani Temple in Ranu Near Vadodra Gujarat India. 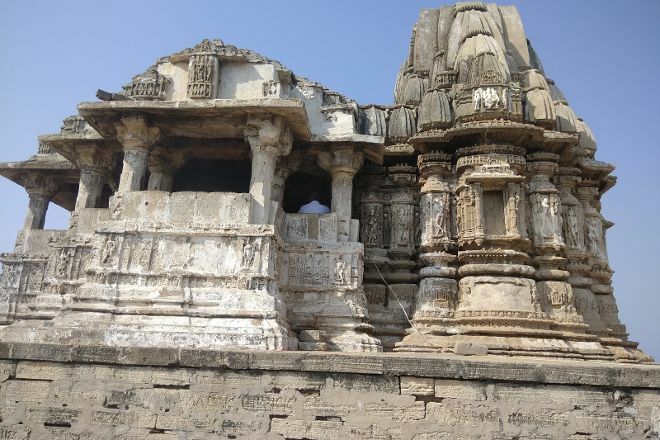 Tulja Bhavani temple is most popular temple which is situated in small village Ranu near Vadodra Gujarat.The temple is about 700 years old.The statue/ idol was found by one saint. The present mahant offered us food and it was blessing of mother. She is the family goddess worshipped by the Maharaja Gaikwad of Vadodara.During Navratri days, the idol of Tulja Mataji are decorated with precious diamonds & rare jewelry given by Maharaja Malharrao Gaekwad, 150 years ago. 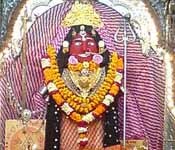 After the festival is over, the diamonds & jewelry are kept in locker in Padra.Tulja Mataji are kuldevi of the royal Gaekwad family. The family members still come here to seek the blessings on 8th day of Chaitra Navratri & Aaso Navratri. Mahant Kavindragiri, the care taker of temple says that 700 years ago Brahmshree Vishwambhar Giriji Maharaj came to Ranu village for worshipping Mataji & to serve the people. From blessings of mataji, they lit an diya near a small temple there. At back side of temple, they dug a small place called Mansarovar, where they found statue of Mataji, which is the idol of Shri Tulja Mataji, now installed in the Temple. One can also see 700 year old diya till lit up inside the temple. Seven hundred years ago Saint Shree Vishwambhargiriji Maharaj stayed at Tuljapur in Maharastra. He was true devotee of Maa Tulja Bhavani. One day he Pray to Maa that u made your Dham in South but Maa what about north? Devotees having lots of trouble to reach here for your darshan. Maa listen his prayer and one night Maa came in his dream and said him that I am with u in your Akhand Jyot. U go where people facing water problem, and fulfill their requirement of water by digging ponds and cherish there life. And u will find me while digging the Pond at one of the place. As per the year of Indian Hindu calendar vikram samvat One thousand three hundred sixty three and the day was Sunday durgastmi Saint Shree Vishwambharji Maharaj reached at Ranu with his Akhand Jyot. In order to bless the mankind who are illiterate and ordinary human beings who are unknown of Upanishads and Sastras, as Maa said to Saint Shree Vishwambharji Maharaj to search for her in one of the pond in saakara as idol form. Saint Shree Vishwambharji Maharaj Start Akand Dhuna with Akhand Chit. And finds a saakara Maa’s idol in one of the pond at Ranu. Before 200 hundred years ago Shri Swaminarayan Bhagvan and his followers visited Ranu for the blessing of Maata Ji. He had a bath in Maan Sarovar from which Maataji’s idol was found and also did seva, pooja, and aarti. He was very much satisfied by blessing of Maa and told his followers that “Shiv and Shakti are one. There is nothing without Shakti. So who every will do pooja of Maa Tulja over here he will also get a blessing of mine too.” At that time Mahant Shree Prabhatgiriji Maharaj and Shri Swaminarayan Bhagvan both had satsang at Ranu in the temple of Maa Tulja Bhavani. Shree Swaminarayan Bhagvan impress with Saint Shree Prabhatgiriji Maharaja’s bhakti and devotion towards Maa. Shree Swaminarayan Bhagavan Gifted his own “Shal”(Gaudadi) to Mahant Shree Prabhatgiriji Maharaj at Village Dabhan During his Satsang, till date the “Shal”(Gaudadi) is available for darshan for the devotees in temple. 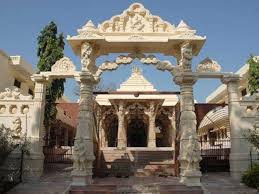 Harsiddhi Mata Temples are found at many places around world. 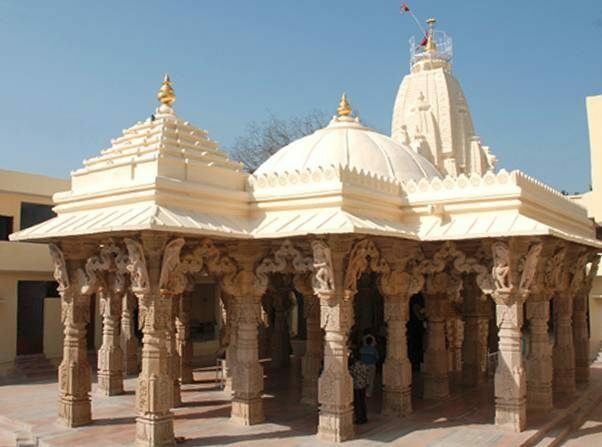 The Main temple is located at Gondhavi village Koyla Dungar(Hill), some 30 km away from Porbandar en route to Dwarka. 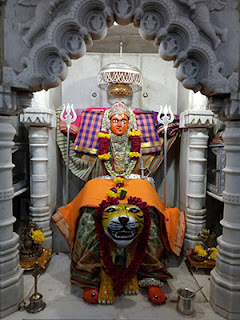 Others temple located in Ujjain, Harsool, Indoor, Ladol, Rajpipla, wadhvan and many.Here is some fact about Harsiddhi Mata Temple in Gondhavi village Koyla Dungar(Hill) near Porbandar Gujarat India. How to Reach by Air : The nearest Airport is Porbandar Airport (35 KM). How to reach By Rail: The nearest Railway station is Porbandar Railway station.(30KM). Harsiddhi Mata Temple is situated at Hiltop Koyla Dungar(Hill) near Porbandar.The temple was built in Dwapar yug (Lord Krishna time) and built by Lord Krishna. 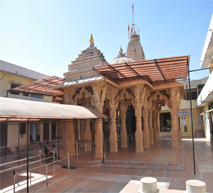 The temple is dedicated to Lord Krishna Kuldvi Goddess Harsiddhi.The other names that are given to Goddess Harsidhhi are Harshal, Harshad, Sikotar, Harshat Shikotar or Vahanvati. Harsiddhi Devi knows as Kuldevi of Krishna and Vaishnav and chouhan family. To kill asura(Rakshash) shree Krishna worship to Shree Harsiddhi devi and she established love and peace by killing asura. There are 300 steps to go to the temple at the top of the Koyla hill, from the top, the other form of nature is seen in the form of a river because the Arabian sea is visible in the foothills. 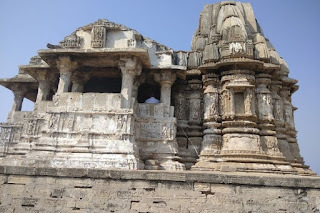 The mythological story of how Mataji came down from the top is also very interesting.The temple is on the top of the hill with the destroyed temple structure. It is believed to be a Shiva temple destroyed by invaders. There are certain controversies surrounding the deity of the temple. Some believe that there was a female deity and some believe male. The view from the hill top is picture perfect with landscape. It has views of hill, sea and river. There are various budgeted hotels and dharamshalas in the vicinity of the city. They provide a comfortable stay for the devotees during their visit to the temple. This temple has great story, still at the time of Aarti (morning 5am) people say Jhoomar shakes on it's own.It is said that, in the 13th century, there was merchant named Jagadu wrecked after the eyesight of Harisiddhi Mata fell on the ship. To prevent this, he used to offer coconut fruits to Mata Ji, but once he forgot to offers and consequently his 6 out of 7 ships wrecked in the sea. Koilaya, they had to recite their coconut in the sea. So that their travels could be settled down. Once Kutch’s businessman Jagadusha got his goods filled with goods in seven ships, he started to roam the trade, but he forgot to come to. The merchant was very sad with this incident and came Harisiddhi Mata temple and prayed to her and requested the Maa to help him get his wrecked ships back. He also requested Maa that from now no ships of any merchants should burn and wreck. The mother said to test Jagadu, “If you sacrificed buffalos to her at every step, I would come down. Jagadu accepted the Mataji’s condition and sacrificed one animal at every step, but when the last four steps were left, he was left with no animal to sacrifice, then Jagadusha sacrificed his son, two wives and sacrificed himself at the last step. Ultimately, Mataji was pleased with his devotion and resurrected Jagadu, his son, both wives.